Capital Gains Tax or CGT is a tax on the gain or profit you make when you sell anything, give away or otherwise dispose of something. It applies to assets that you own, such as bullion, shares or property. There’s a tax-free allowance and some additional reliefs that may reduce your Capital Gains Tax bill. Most bullion investors will never have to pay this tax due to the size and value of their investment however, it is important that investors know the rules. Capital Gains Tax is only payable if an investorÂ makes over Â£11,000 of profit in one financial year.Â Remember that the Â£11,000 limit is not the total value of selling your bullion, butÂ is justÂ the profit made from your original outlay. For example, if an investor brought some gold in 2014 for Â£35,000 and sold it in 2015 for Â£46,000, no Capital Gains Tax would be due as only the Â£11,000 profit made is taken into consideration. However, this single transaction would constitute the investors full tax free allowance for the year and any other profit made would be taxable at a rate between 18 to 28%. Please note the tax free limit of Â£11,000 is only set for the financial year of 2013-2014 and is reviewed every year. To access the Capital Gains Tax section of the HMRC website for more information please click here HMRC on Capital Gains Tax. Please note it is the responsibility of the individual investor and not that ofÂ Plus GoldÂ to declare any Capital Gains Tax payable. Here at Plus Gold, we keep records of all transactions made forÂ 8 years however we do not voluntarily forward details on to the HMRC unless specifically requested. We advise that you speak to your accountant in further detail to ensure your personal situation is in order. If you do not fully understand Capital Gains Tax, then please come into our shop and we will gladly explain everything to you over a coffee or tea. Capital Gains Tax is exempt on all British legal currency. 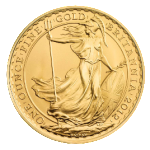 This includes gold Britannia coins , silver Britannia coins andÂ full and half gold Sovereigns . Which means, you can make an unlimited tax free profit on investments of any size and value on all these British legal currency bullion coins.